► Switch off the lights. Only remove screws 3. Do not turn adjustment screw 4. 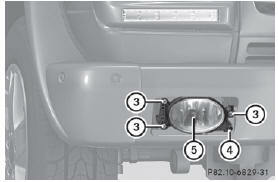 If adjustment screw 4 has been turned, the front fog lamp adjustment must be checked at a qualified workshop. 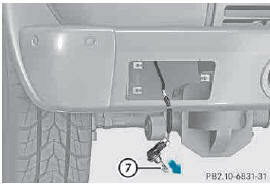 ► Lightly press bulb holder 6, turn it counter-clockwise to the stop and pull it out. ► Take bulb 7 out of bulb holder 6. ► Insert the new bulb into bulb holder 6. ► Insert bulb holder 6 into lamp A and turn it clockwise to the stop. ► Replace and tighten screws 4. 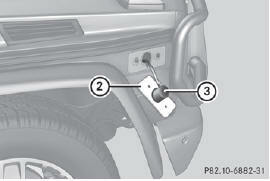 ► Replace and tighten screws 1. Make sure that the protective grille does not hit any painted surfaces. You could otherwise damage the paintwork. Do not fasten the screws too tightly. You could otherwise damage the lens. 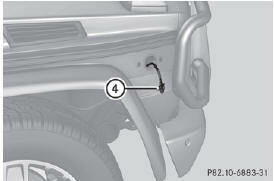 ► AMG vehicles: pull protection grille 1 in the direction of the arrow out of mounting 2. 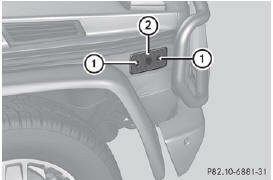 ► Fold up protection grille 1. ► Turn bulb A counter-clockwise, applying slight pressure, and remove it from the bulb holder. 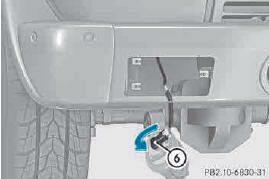 ► Insert the new bulb into the bulb holder and turn it clockwise until it engages. ► Replace and tighten screws 5. ► AMG vehicles: fold down protection grille 1 and allow it to engage in mounting 2. 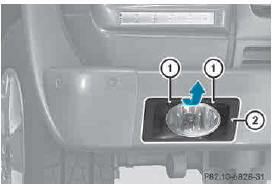 The bulbs of the front and rear side marker lamps are changed in the same way. ► Remove dust cover 3. 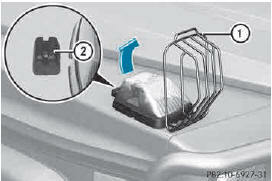 ► Push the catch to the side and pull the bulb holder with the bulb out of housing 2. ► Lightly press bulb 4, turn it counterclockwise and pull it out. ► Insert the new bulb and, applying slight pressure, turn it clockwise until it engages.> X Insert the bulb holder into housing 2.> X Attach dust cover 3.> X Insert housing 2.> X Replace and tighten screws 3.